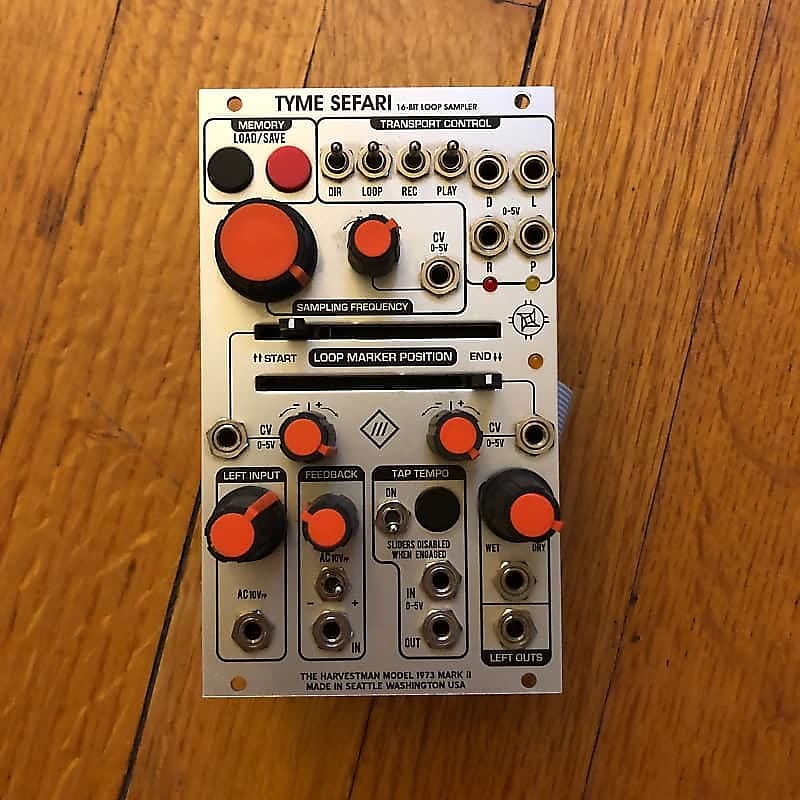 Harvestman Tyme Sefari 216-Bit Loop SamplerTyme Sefari is a voltage-controlled audio buffer designed for live resampling of music TRANSPORT CONTROL The buffer operates in a circular manner, meaning that when the end of the memory is reached, the playback and recording position reset to the starting position. When the PLAY switch or gate input (P) is active, the contents of memory will be sent to the audio output jacks, and the playback position will advance. This mode is indicated when the YELLOW LED is lit. When the REC (R) control is active, new data will be taken from the audio input and written into memory. This mode is indicated when the RED LED is lit. The DIR jack (D) and switch control the direction of playback/recording, and can be modified in real time. The SAMPLING FREQUENCY control determines the speed of playback and recording. Note that if PLAY is not active, then no RECording will take place until PLAY is made active again. It is the master control for the operation of the transport.If the LOOP switch or gate jack (L) is active, then the travel of the play and record "heads" within the memory buffer will be constrained. Use the START and END sliders to define the window of playback. If the START position is set to be greater than the END position, then the direction of travel will be reversed.The LOOP sliders can also be disabled by activating the TAP TEMPO toggle switch. In this mode, the recording and playback length will be determined by the time between button presses (or gate input events) of the TAP TEMPO control group. This control will begin to modify the loop length after four (count 'em, four) button presses or gate inputs are made. Subsequent presses will be averaged into the determined tempo value.When the loop end point is reached in all modes, the orange LED near the slider will briefly light up, and a trigger event will fire from the TAP TEMPO OUTPUT jack.The four transport controls will activate their function if the switch is in the UP position, OR if the gate input is currently reading a HIGH signal. This enables remote control or automation of the four parameters, as well as advanced audio effects when modulated at faster-than-human rates. ANALOG I/O The FEEDBACK control mixes part of the output audio back into the input amplifier, with optional inversion set by the associated toggle switch. An input jack is provided here, so you may break the feedback loop by patching in an alternate signal. By using the additional output jack, an external processor, and this FEEDBACK input jack, you may insert different effects into the feedback loop such as a filter effect, for behavior similar to an "analog" delay device. Two main audio outputs are given. The upper is a "MIX" jack with the signal's wet/dry ratio set by the associated knob. The bottom jack is simply the output of the recorded signal with no dry signal mixed in. CV INPUTS The large controls for LOOP START and END, and SAMPLING FREQUENCY all have smaller CV attenuators attached to them as well. When these small knobs are adjusted to the center position (so that the knob sits in the center detent), no signal from the associated CV jack will be passed to the parameter. When the attenuator is turned counter-clockwise, the CV input will be subtracted from the parameter value. When it is turned clockwise, it will be added to the parameter. The voltage specifications for each CV input (as well as all other inputs) are given on the panel. Voltages outside of these ranges will not harm the module unless they exceed +/- 12V DC, but they will not have any additional effect outside of the specified range. NONVOLATILE STORAGE The MEMORY SAVE button will pause the audio for a few seconds and write all of the memory contents to non-volatile backup. This means that you can recover it after the module has been powered down. If a jumper is installed across the "WRITEPROTECT" pins on the back of the module's circuit board, this button will have no effect.The MEMORY LOAD button will retrieve the contents of the memory backup and place it into the recording memory. This will also stop audio for a few seconds. When you first obtain this module and install it in the rack, I suggest pressing this button first. I left a surprise in there for you.If you hold down the TAP TEMPO button and press the MEMORY LOAD button, the recording memory will be blanked out for your convenience. SUGGESTED APPLICATIONS ONE-SHOT SAMPLER Disable the PLAY control, and re-activate it by flipping the switch or activating the P gate input. When this happens, the sampler will automatically reset to the memory (or loop) start point for predictable sample playback, useful for dialogue, percussion, or other sonic events where a strictly defined start time is important. DELAY EFFECT Turn the "FEEDBACK" control up and activate LOOP, PLAY, and REC controls. The position of the LOOP sliders will determine the length of your delay. Note that the loop sliders have a limited resolution, as they must traverse a great deal of memory. Great care has been taken to provide a click-free delay effect in this mode, but should you require a finer loop resolution you must use the TAP TEMPO mode in this delay configuration instead. THRU-ZERO DRONE PLAY back a recorded segment of audio. Patch an audio-rate square wave into the D input. This will result in a thick, chorused pitched drone with no added discontinuity. Adjust the pitch of this tone with the SAMPLING FREQUENCY control, and the length of the waveform by adjusting the input square wave. Note that any deviations from 50% duty cycle in this square wave will result in the "window" shifting in memory. Play with the loop sliders for additional effects. FALSE TIMESTRETCHER PLAY back a recorded segment of audio with LOOP active. Set the START slider to minimum. Set the END slider nearby, so a very short loop is played. Now, take an external, slow ramp LFO voltage and apply it to both the CV START AND END inputs in equal amounts. Vary the speed of the LFO to control the speed of the "timestretched" playback. This offer was fetched from reverb.com. You cannot contact the seller via ModularGrid. You have to visit their site.